With the care packages sooo close to being ready, I’ve been thinking more and more about what it is that I can give to clients, & any woman who buys/is gifted the momma box. Is it the soothing organic shea & cocoa belly butter? Is it the relaxing lavender bath salts? No. I believe it is the info card. 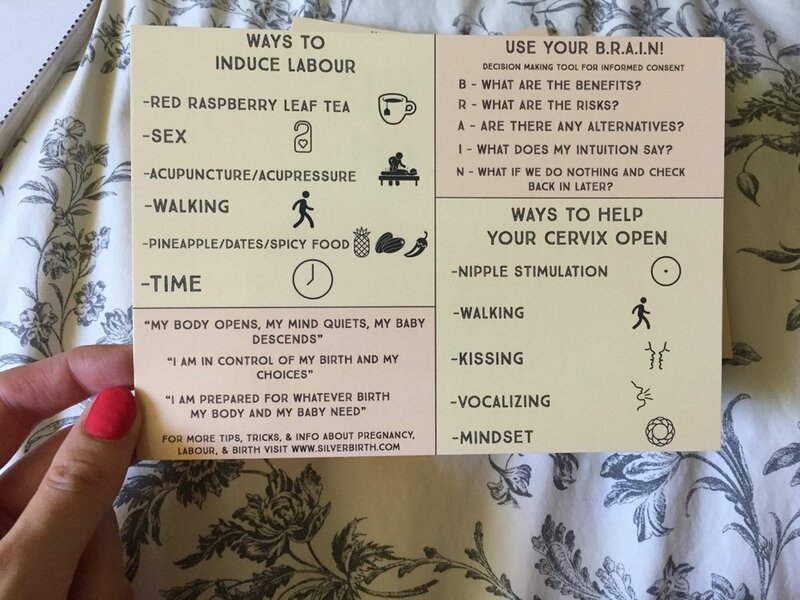 Yes it’s pretty, and it has some cute tips & tricks for getting labour going, and helping your cervix open up. But what it also has the BRAIN acronym. Something that every pregnant woman needs to know. It’s that sliver of knowledge that I hope will register in people’s minds that birth is something they have control over and must, if it comes down to it, fight for. The article goes on to describe this amendment as “fetal personhood”. I am so shocked & saddened to read this. This pushes us so far back in time. How can anyone agree with this amendment, and believe that it makes sense for anyone other than the mother carrying the fetus to make choices for it? It’s flabbergasting. My heart hurts for women in Alabama. This amendment is a stripping of their rights, and I sincerely hope that changes will be made for the better, and that no one has to suffer. But I know that unfortunately that won’t be the case. These laws make it difficult to believe otherwise. I urge you to find out the laws where YOU live. Know your rights. I’m lucky to live in Canada. I love our healthcare system, how accessible help is for us, and that we have clear birth rights. The Ministry of Health has a guide on consent for practitioners. 5. The right to be involved to the greatest degree possible in all case planning and decision making. If you also live in Canada, please know this! Please use it if any medical professional tries to make you do something you don’t feel comfortable with. You deserve to know all of your options, to have time to learn & understand what they are, to make a decision that feels right for you, and have that decision be respected. I’ve said it many times before and I will keep on saying it, informed consent is everything. The reason I do this work isn’t just because of adorable babies, it’s because women deserve to be treated with respect always, especially when we give birth. I don’t care how you wish to give birth. I really don’t. If you know you want an epidural, that’s great! Let’s get you one. I just want to make sure you’re aware of all the benefits & risks, and that you make an informed decision regarding this matter. Same goes for non-medicated birth. Knowledge is power, I firmly believe that. Being armed with knowledge increases your chances of having your ideal birth. That is the most valuable thing I can give you, the push to learn. Do you know your rights? Let me know in the comments!